RESEARCH: Mushrooms eat plastic and you can eat them. Feeling guilty about all the plastic you’ve been throwing out, and what it’s doing to the environment? Well it might soon be possible to eat that guilt away—or at least, eat some plastic. That’s what a recent contraption from Livin Studio makes possible. 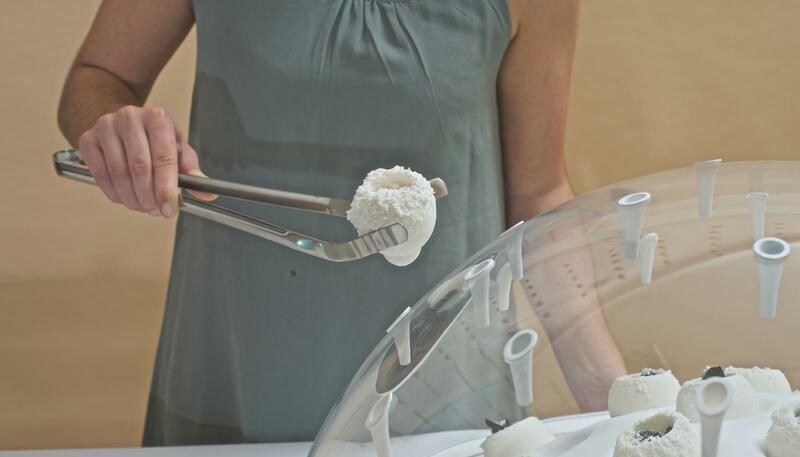 Designers partnered with scientists at Utrecht University to create what they call the “Fungi Mutarium,” which uses circular molds made of agar—an edible, seaweed-based gelatin-like substance that fungi can grow on—to hold plastic strips and a type of fungi that decomposes plastic. Before the plastic goes into the growth sphere, it is decontaminated using UV light. After a few weeks, the fungi, derived from two kinds of mushroom, have broken down the plastic bits and become an ”edible fungal biomass,” as the Livin Studio site calls it.